The Custodian of the Two Holy Mosques King Salman bin Abdulaziz chaired the Cabinet’s session at the Al-Yamamah Palace in Riyadh this afternoon, briefing his Cabinet on the outcome of meetings with foreign leaders, during which they reviewed the bilateral relations and the overall regional and international developments. King Salman spoke of the support many international leaders expressed for Saudi-led Operation Decisive Storm in Yemen against the Houthi rebels. 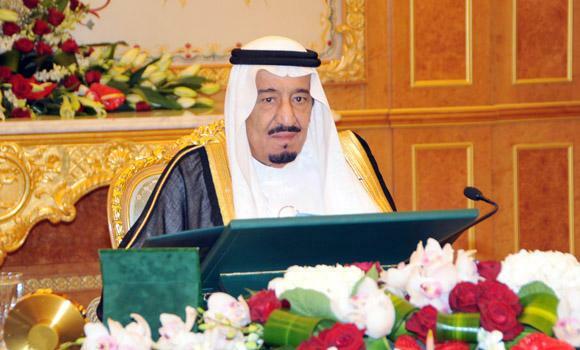 King Salman spoke of re-establishing and maintaining security and stability in Yemen, as well as reiterating the Kingdom’s offer to host a conference with Yemen’s those political factions of Yemen interested in regusing the coup against the legitimate administration of Yemen. The Council of Ministers reviewed the the 26th Arab ‎League Summit and it’s outcome including the summit’s declaration. The Council of Ministers also condemned the continued Israeli violence and violations of international law in supresing an unarmed Palestinian population, repeating the Kingdom’s demands for the international community apply a pressure on Israel to accept the sovereignty and legitamacy of it’s occupied territories. The Council also stated that the Israeli Prime Minister Benjamin Netanyahu’s opposition to an indepenant and sovereign Palestine is a “blatant disregard for international law”. – Authorized the President of King Abdullah City for Atomic and Renewable Energy, or his deputy, to discuss with Finland and Hungary draft agreements in the field of peaceful uses of atomic energy, sign them, and then submit the final signed versions to complete the statutory procedures.